Pulls in items from thousands of large and small retailers. Only available for iPads at this time. Shopping online may save money, but it doesn’t replace the fun of spending the afternoon with friends going from store to store. Flit’s app may be the closest to having that shopping experience on your iPad. How exactly does Flit capture the mall shopping experience in an app? The app lets you connect with your “Shopping Friends” to follow your friends shopping activity and to share yours. You can “Cute” to save any item that catches your eye. “Cutes” can be shared with friends to get their opinion and advice, just like you’d do when out shopping with friends. Just like the offline world, Flit makes going from store to store easy. 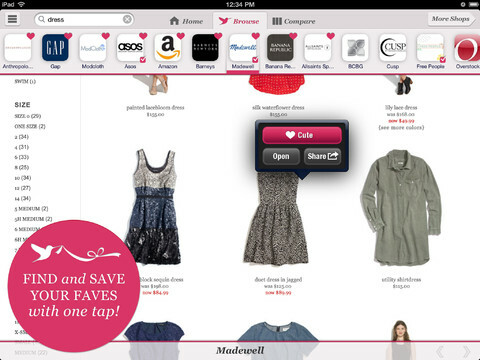 Shoppers can jump to the next store without having to visit other websites or retype what they want to see. The app can access products from an impressive 1,000 retailers. And more are being added. That makes your feet hurt just by thinking about shopping many stores at the mall! While jumping from store to store, Cutes can be compared side-by-side, even from different stores. Compare sandals from Nordstrom with a pair at Macy’s right on the same screen. Flit leaves no stone unturned when it comes to finding the right item. Going beyond big retailers, the app also includes private sales, fashion blogs, and even social sharing sites like Pinterest. And a shopping app wouldn’t be complete without alerts on great deals and new arrivals, and Flit is no exception. Flit is for free for the iPad. This app is not optimized for the iPhone at this time.